I love watching the colors change across the mountain-side behind our farm, from shades of green to red, orange, and yellow. It is a beautiful time of the year. Closer to home, there aren't many colors left to enjoy through the rows of crops, from greens and reds to shades of brown. I'm hoping that touch of WHITE I saw on the mountains Monday won't come back again for a few more weeks. Found another interesting veggie shape on the farm this week that I couldn't resist taking a picture of. This photo is dedicated to the romantics out there. You know who you are. 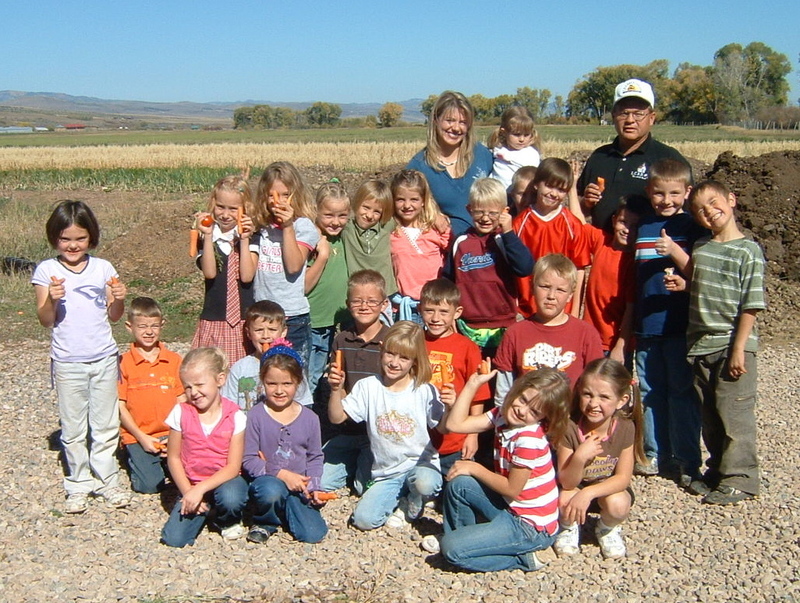 Last Friday, Mr. Hathaway's class from Afton Elementary School came to visit the farm. (That's my son Eli on the right in the green striped T-shirt.) They had a good time learning about things like making compost, why we use row covers and greenhouses, feeding pigs, and milking goats. We also dug up a short row of potatoes, picked tomatoes and washed up as many carrots as they wanted to eat. FYI: (In the photo above) No, the kids are not giving you the "thumbs-up" sign, they are showing you their yummy carrots. 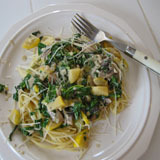 I posted a new recipe this week for Ministrone. You can find most of the ingredients from the veggies you are getting from the farm. I think it will be a good way to use up any extra produce you have in the fridge. I can personally verify that the results are wonderful. Basil - the last, not in the best of shape (from the cold) but will still make good pesto. Another idea for the basil is to wash it and then put as much as you can in a small jar with a tight lid (like a jelly jar, half-pint jar, or baby food jar). Then pour extra virgin olive oil over the basil. Tightly close the lid and put in your fridge for at least 3 weeks. Then use the olive oil for cooking. The flavor will be incredible. Salad? The rows we were cutting off got "ugly" before it's time, due to the frost we got last week and an infestation of bugs. The new plantings aren't growing very quickly, but the leaves look good and I don't see many bugs. I'm fairly confident it will be ready next week. This week I recommend cooking up a batch of Leek and Potato Soup. It is one of our family favorites. 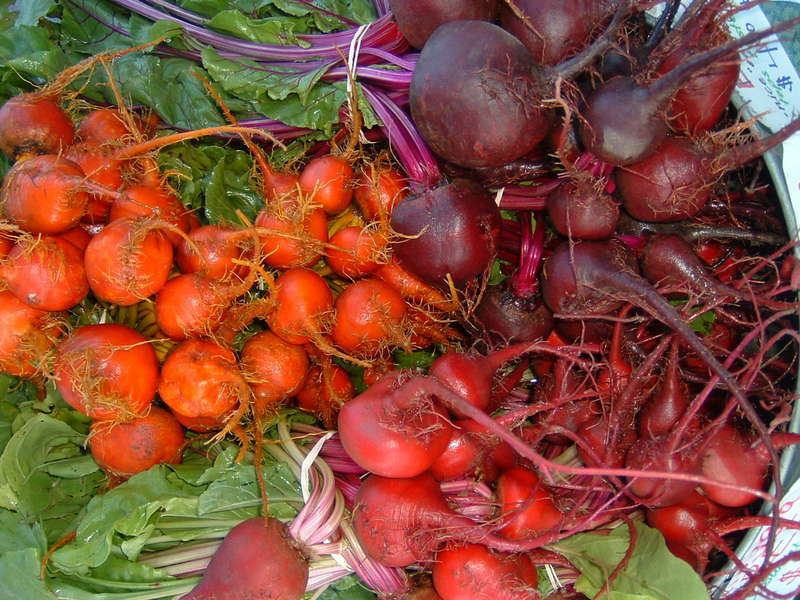 What to do with Beets? ROAST THEM. In my opinion, once you have them this way, you'll never go back to boiling them again. This is my recommendation. 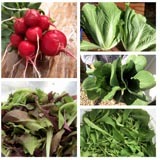 Wash beets and cut of stem and root "tail". Cut into bite sized pieces. Spread on a baking sheet and drizzle with olive oil. Bake in the oven at 400', stirring around every 10 to 15 minutes, until tender enough to poke with a fork. Removing the skins is not necessary. Serve immediately or cool completely and serve cold (nice with a salad). In 1997, we moved to Star Valley, away from friends and family. Being away from family has it's benefits, like not having to go to EVERY baby shower and wedding for EVERY cousin, second-cousin, or my mother's cousin's daughter's bridal shower, etc. (Sorry Mom). But having all our family at least 3 hours drive from here has some draw backs too. Last week I wished for the support and extra help that comes from family when you get hurt and need some sympathy and time off. However, it was impossible to feel this way for long. Almost immediately, the extra help and concern came pouring in. I appreciate your kind words and thoughts on my behalf, and for Shain too. (Lucky guy, he's already back to work, "full steam ahead".) I am most appreciative of the extra hours so many of the Workshares have been putting in, several of them coming to work extra days as well. They are incredible people and each week I'm impressed with how much food they help harvest from this farm. I still miss my family, but it has occurred to me lately that there are many folks in this community who are ready and willing to step in when needed. This farm has given me the opportunity to meet some wonderful people. Thank you. We experienced some below freezing temperatures this past Sunday and Monday nights. 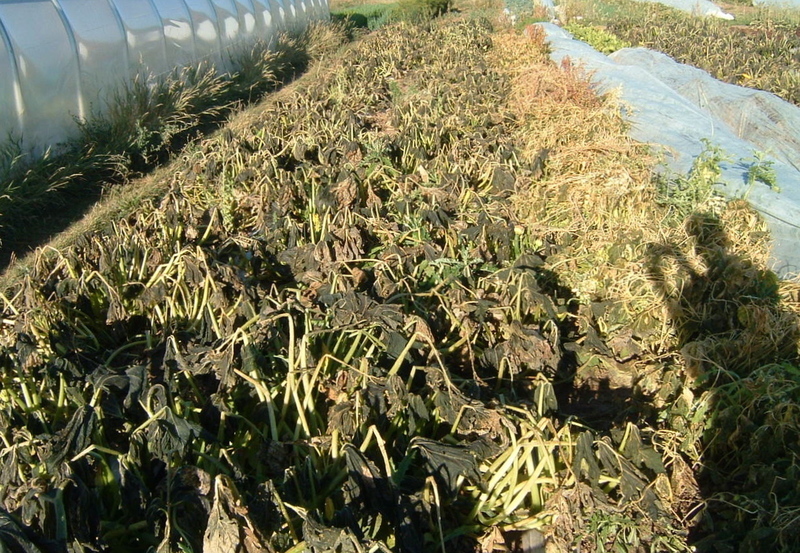 The photo above shows the damage frost does to a row of zucchini and beans. (That's a self portrait of me on the right side.) Shain was out working hard on Sunday night covering crops to protect what he could from the expected cold. But there comes a point each season when we just have to say "These plants have given us a good harvest and it's time to move on." 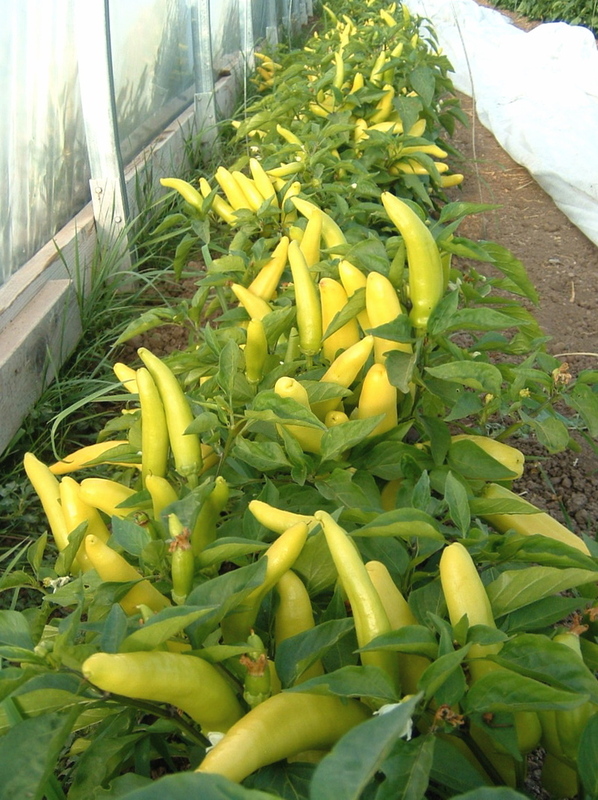 These lovely peppers will be in your share this week. Notice the white cover to the right. They'll be covered every night from now on and uncovered each morning. We've been holding off on harvesting them because they are supposed to mature to a nice orange color. Their name is Bulgarian Carrot Chile Pepper, but right now they look more like bananas. Yesterday Shain did a taste test and decided they have enough kick to start picking now anyways. Cucumbers - may be the last? Zucchini & Squash - may be the last? I can't believe they made it through the freeze. Red Norland Potatoes - the first of many weeks to come. The yellow tomatoes you are getting this week are called Taxi. They have less acid so the taste is a bit tropical, even fruity. The red tomatoes are called Bell Star. They are a paste tomato with more flesh and less juice, good for salsa. Due to the quantity of tomatoes we harvest each week, it is difficult to pick them all when fully ripened. Leave firm unripened tomatoes on your counter top and they should be ready to eat in a few days. Because you are getting more zucchini this week, I went ahead and added a few zucchini recipes to this website. Go to the recipe link on the right side of this blog and you should find them. 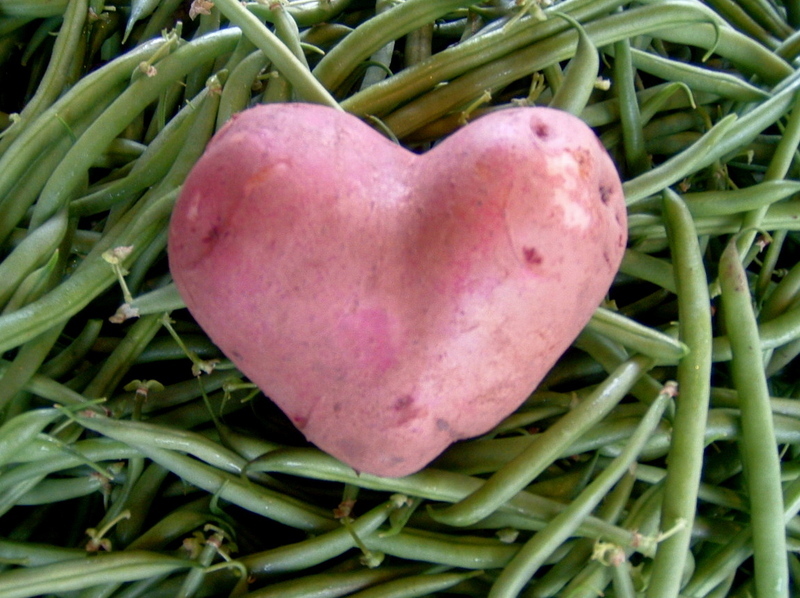 If you've been looking for an excuse to come visit the farm, Shain will be digging potatoes all day Saturday. Stop by for an old-fashioned farm experience. Do your kids know where potatoes come from? Hello again to you all. Hope you had a nice holiday. The good news: Thankfully the temperatures have stayed warm enough this past week to give us a good crop of outside (meaning out of the greenhouse) green beans. Your share is a bit light this week as a result of some inconvenient circumstances (see "bad news" below). This will give you a chance to get caught up on any produce still hanging around in your frige. The bad news: My back has rebelled (all on its own, I assure you, I had nothing to do with it) and I am not supposed to be working. Well, not working that hard, or lifting heavy objects. Is that really a possibility with all of this food to bring in? This week's farm yield will be brought to you by our dedicated Workshares, of few of whom wouldn't let me pick a bean on Tuesday if I tried. Sorry, no pictures this week, and no recipes. Shain and I are wiped out and becoming better acquainted with our local Chiropractor. A few lighter days of work and some extra sleep should get us back into the groove. **Please recycle/return the mesh bags that will be coming to you over the next several weeks (with your tomatoes, garlic, potatoes and peppers). We can use them over and over again if they aren't ripped open.